THEMAC Resources Group Limited (TSX VENTURE:MAC) (“THEMAC” or the “Company”) today announced details of its 2012 exploration and drilling program at the Copper Flat copper project, New Mexico. As stated in the Company’s update NI43-101 resource statement filed February 2, 2012 on SEDAR, the Copper Flat deposit currently contains a Measured and Indicated Resource totaling 194,097 Ktons averaging 0.26% copper, 0.008% molybdenum, 0.002 Oz/t gold and 0.05 Oz/t silver. Additionally, the deposit contains an Inferred Resource totaling 8,206 Ktons at a similar, but slightly lower average grade. 1. Increase the existing resources by extending known moderate to higher grade mineralization in all directions. The results of this extensional drilling will also be used to optimize the shape and orientation of the final pit design in the upcoming pre-feasibility study. 2. Upgrade additional Inferred Resources to the Indicated category. 3. Further evaluate and better define deeper (greater than 1,000 feet below the surface), higher grade (greater than 0.50%) copper mineralization. 4. Further evaluate the structurally controlled gold and silver mineralization within and proximal to the Copper Flat deposit. In addition to and in conjunction with the planned exploration and definition drilling, three to six steeply inclined core holes will be drilled to obtain additional geotechnical information, which will aid in the final pit design to be used in the upcoming feasibility study. Other work that may be undertaken during the 2012 exploration program includes the continued re-logging of historical core; and, in addition to the 2969 pulps re-assayed in 2011 it is planned to assay 4,000 more pulps from historical drilling to confirm copper and molybdenum grades as well as obtain needed gold and silver data in an effort to increase contained precious metals. Additionally, work will be directed toward updating the existing geologic map and undertaking geological reconnaissance and prospecting. The advanced stage Copper Flat project is the site of a Laramide porphyry copper-molybdenum deposit containing recoverable gold and silver credits located in the Las Animas Mining District of Sierra County, NM, approximately 150 miles (242 kilometers) south of Albuquerque, NM and 20 miles (32 kilometers) southwest of Truth or Consequences, NM. 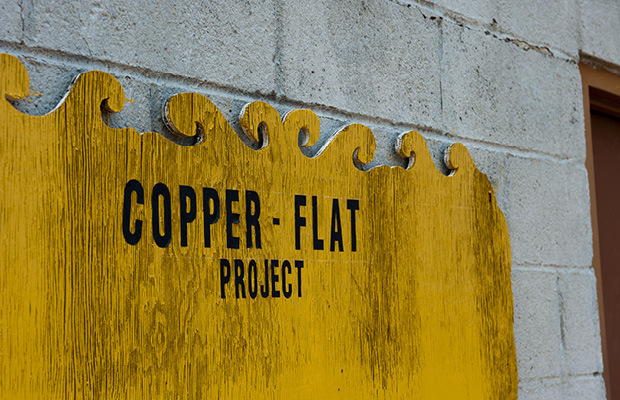 The Copper Flat project consists of 26 wholly-owned patented mining claims, 184 unpatented mining claims and 29 placer mining claims totaling 4,241 acres (1,717 hectares). THEMAC is a copper development company with a strong management team and as of May 18, 2011, a 100% ownership interest in the Copper Flat copper-molybdenum-gold-silver project in New Mexico, USA. We are committed to bringing the closed copper mine, Copper Flat, in Sierra County, New Mexico back into production with innovation and a sustainable approach to mining development and production, local economic opportunities and the best reclamation practices for our unique environment. The Company is listed on the TSX Venture Exchange (ticker: MAC) and has issued share capital of 74,117,622 common shares (fully diluted share capital 136,423,241). This news release may contain certain information that constitutes forward-looking statements. Forward-looking statements are frequently characterized by words such as “plan,” “expect,” “project,” “intend,” “believe,” “anticipate” and other similar words, or statements that certain events or conditions “may” or “will” occur, including statements regarding planned work on the Copper Flat Property. Forward-looking statements in this news release include statements regarding the nature, purpose, timing, amount and expected results of the Company’s 2012 exploration and other work programs. Forward-looking statements are based on the assumptions, opinions and estimates of management at the date the statements are made. The assumptions made by the Company in preparing the forward looking statements in this news release, which may prove to be incorrect, include: that new drilling will identify new resources and upgrade or better define existing resources. The forward looking statements made in this press release are subject to a variety of risks and uncertainties and other factors that could cause actual events or results to differ materially from those projected in the forward-looking statements. These factors include the inherent risks involved in the exploration and development of mineral properties, the uncertainties involved in interpreting drilling results and other geological data, fluctuating metal prices, the availability of funds to complete work programs and studies, and other factors described above. The Company disclaims any obligation to update or revise any forward-looking statements if circumstances or management’s estimates or opinions should change. The reader is cautioned not to place undue reliance on forward-looking statements. Neither the TSX Venture Exchange (the “TSXV”) nor its Regulation Services Provider (as that term is defined in the policies of the TSXV) has reviewed, nor do they accept responsibility for the adequacy or accuracy of this release.